As the weather turns brisk, you might find yourself doing a double take when you spot the gorgeous fruits of this month’s weedy plant, porcelain berry (Ampelopsis glandulosa var. brevipedunculata). The luminous berries cluster in a showy display of sparkling blues and purples. 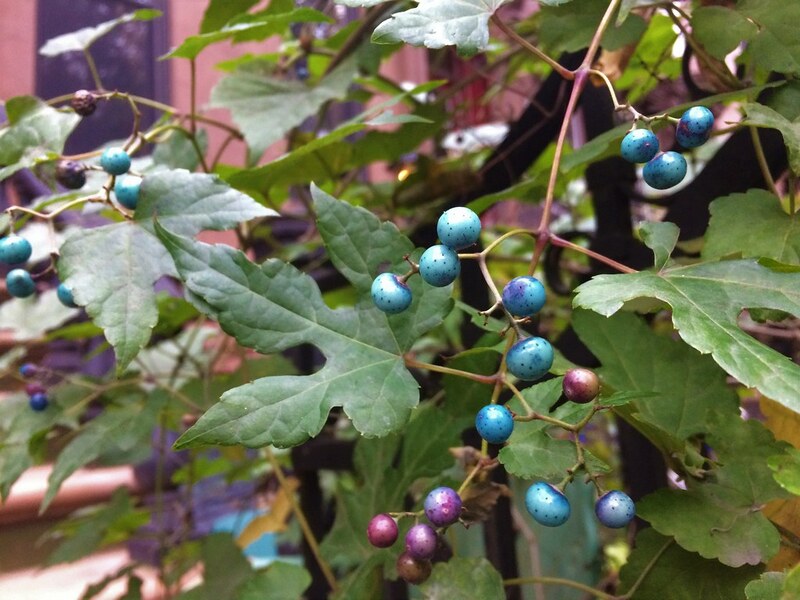 Resembling miniature bird’s eggs, the dazzling fruits are the reason this perennial vine was brought to the United States in the 1870s from East Asia as an ornamental groundcover. Those long-ago horticulturists had no idea what an invader they had unleashed on the native flora of the East Coast. So, back to the source of all the trouble: those glittering, speckled berries. How does one plant produce a multicolored cluster of fruits? Porcelain berry coloration comes from the copigmentation produced by the interaction of anthocyanins and flavonols. Anthocyanins are common plant pigments that react to changes in pH. As the berry ripens, the pH shifts from acidic to more alkaline, thereby affecting the color. You may have heard of anthocyanin as the antioxidant present in blueberries and other superfoods that purportedly keep you forever young. Flavonols are colorless compounds that bond with the anthocyanins, resulting in the varied coloration of porcelain berries, ranging from pale pink to dark blue and purplish red. The vigorous root system ensures a competitive edge over local species, and wildlife spread the seeds. Though edible to humans, the fruit are not considered particularly appetizing, tending toward the winning combination of slimy and bland. Porcelain berry is in the grape family, and you’ll notice its lobed leaves and twining habit are similar to those of a grapevine. If you see porcelain berry twisting its way along a fence or hedge, cheer on the Japanese beetles that eat the foliage and do your bit to help our local flora: Pinch off the inconspicuous greenish flowers when they appear in summer, and remove the berries before a bird dines on them and spreads the invasive seeds. This stuff is growing all over Floyd Bennett Field here in Brooklyn. Might want to talk to the National Park Service about it; it’s definitely choking a lot of trees, and there are berries everywhere in the trails. Ampelopsis glandulosa var. Brevipedunculata, an invasive vine. Photo by Saara Nafici. 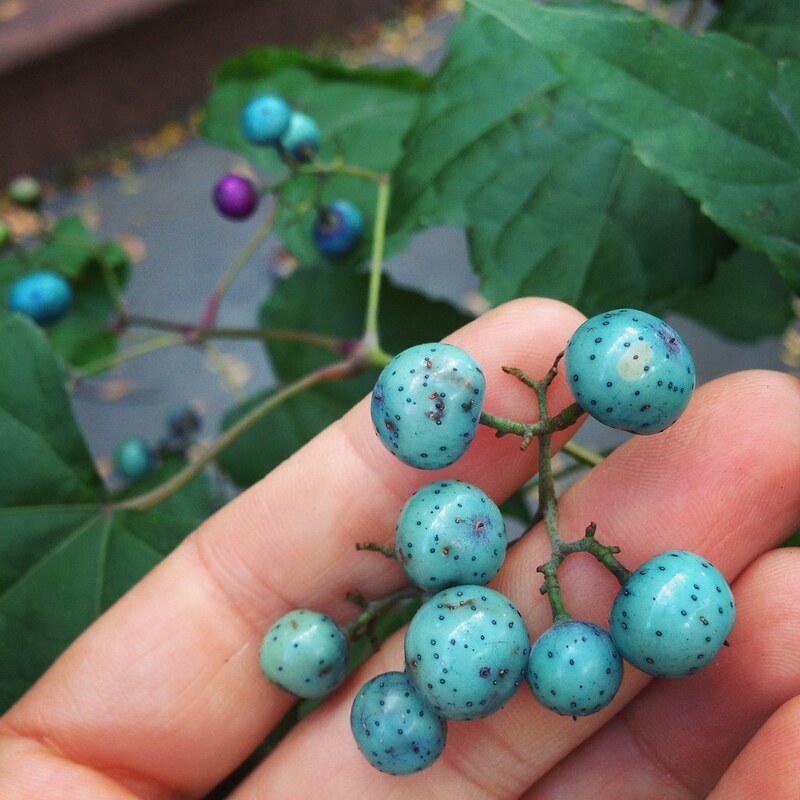 These berries are on the blue end of the spectrum and resemble bird eggs. Photo by Saara Nafici. 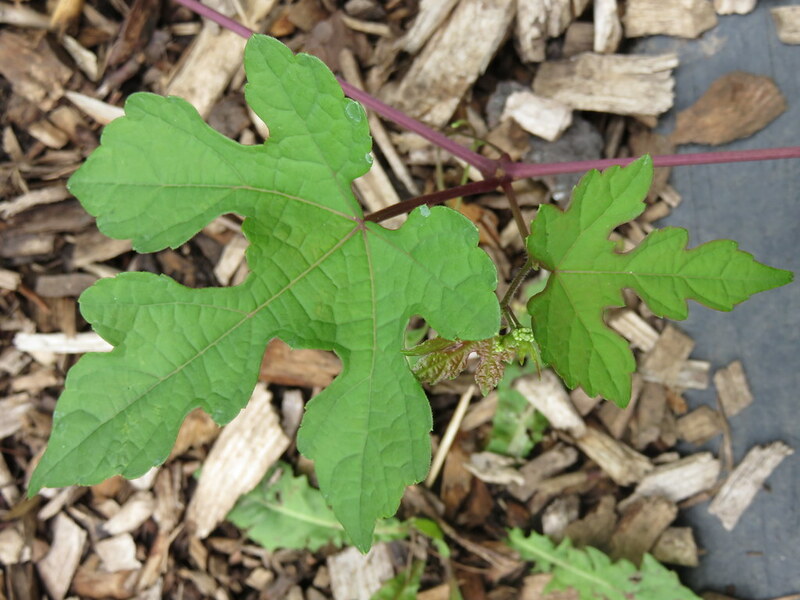 Porcelain berry leaves look very much like grape leaves, and they are in fact in the same family. Photo by Saara Nafici.